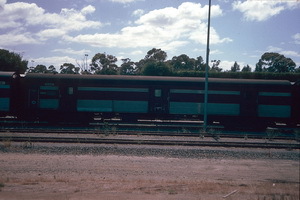 Eleven CD stainless steel passenger brake vans were constructed at Islington workshops in 1965 for use on the broad gauge lines. The first of these brake vans underwent trials in mid May and by the end of July, five had been placed in traffic. 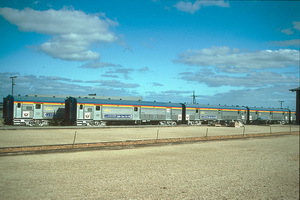 They were used on passenger trains between Adelaide and Port Pirie and also on the Blue Lake to Mount Gambier. 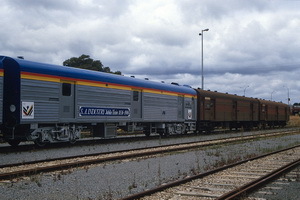 The first traffic run of a "CD" was to Port Pirie on No.511 East West Express on June 10, whilst the first working of a "CD" to Mount Gambier arrived there on July 5. 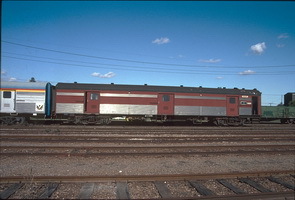 These maroon and silver brake vans externally match the "D" type air conditioned coaches. Mounted on two four-wheel bogies, the "CD" van is 72 foot 3 inch long over coupling points, has a width of 9 feet 9 inch, and a maximum height of 14 foot. Tare weight is just under 39 tons, while the rated loaded weight is 64 tons. The three baggage compartments measure 23 feet 2½ inch (10 tons capacity), 20 feet 11¼ inch (8 tons) and 15 feet 2½ inch (7 tons) respectively, while sliding doors are provided on both sides of each compartments to allow ready access from station platforms. Hinged shelves are fitted in each compartments, and a portion of the floor of the centre compartment is designed for the carriage of fish traffic. Situated at one end of the van is the Guard's compartment 8 feet 9 inch in length and extending the width of the van. Stable type doors on either side provide access from platforms. 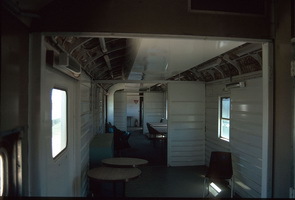 Periscopes on the van roof above this compartment enable the guard to view along the length of the train whilst seated at his desk. Under the floor, a 47 gallon capacity water tank supplies water for the toilet and wash basin. Concertinas at each end ensure maximum protection for traffic staff required to walk to adjoining cars. A further three vans were built for use on standard gauge. These were coded as "SCD". They were originally numbered CD 12-14 and stored at Islington workshops on broad gauge shop trucks after being completed by May 1967. By the time they entered service, three years later in January 1970, they had been renumbered SCD 1-3. See also: AD type carriages and BD type carriages. 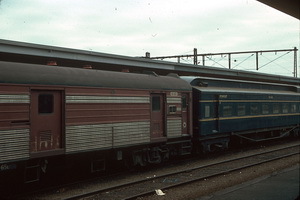 5.1987 Stored at Islington, still painted maroon with SAR on the side. 10.11.1990 TIMS/WMS: shows wagon "AVCY 1 C" as having repair "vehicle recommended condemn". 7.1993 Written off, and scrapped. 30.5.1997 TIMS/WMS: shows wagon "AVCY 1 C" in AN "Mainland Division". Run Restriction: "Unrestricted on gauge(s) shown Inter or Intrastate"
Diagram Book Page No. : "CB B-7"
Remarks: "W/O 10.11.90;STORED ISL. WORKS"
07.12.1992 TIMS/WMS: shows wagon "AVCY 2 L" as having repair "vehicle reclassify". 07.12.1992 TIMS/WMS: shows wagon "AVCP 2 V" issued at location "Islington Works" with a previous code of wagon "AVCY 2 L"
19.12.1992 TIMS/WMS: shows wagon "AVCP 2 V" as having repair "vehicle recommended condemn". 26.12.1988 Return to Australian National. 09.10.1991 TIMS/WMS: shows wagon "AVCY 3 U" as having repair "vehicle reclassify". 09.10.1991 TIMS/WMS: shows wagon "AVCP 3 H" issued at location "Islington Works" with a previous code of wagon "AVCY 3 U"
01.08.1992 TIMS/WMS: shows wagon "AVCP 3 H" as having repair "vehicle recommended condemn". 30.5.1997 TIMS/WMS: shows wagon "AVCP 3 H" in AN "Mainland Division". 7.1965 Entered service as "CD 4". 15.10.1982 Transferred to standard gauge. 18.11.1983 Recoded "AVCY 389" as part of the ROA brake van reclassification. 1986 Used on the Jubilee Trade Train. 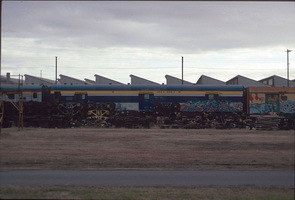 Painted silver blue roof and ends, red and yellow stripes at roof line each side. 09.10.1991 TIMS/WMS: shows wagon "AVCY 389 V" as having repair "vehicle reclassify". 09.10.1991 TIMS/WMS: shows wagon "AVCP 389 X" issued at location "Islington Works" with a previous code of wagon "AVCY 389 V"
01.08.1992 TIMS/WMS: shows wagon "AVCP 389 X" as having repair "vehicle recommended condemn". 17.7.1993 In gillman yard waiting for delivery to Simms scrap metal. 21.12.1993 TIMS/WMS: shows wagon "AVCP 389 X" as having repair "vehicle scrapped". 09.10.1991 TIMS/WMS: shows wagon "AVCY 5 P" as having repair "vehicle reclassify". 09.10.1991 TIMS/WMS: shows wagon "AVCP 5 C" issued at location "Islington Works" with a previous code of wagon "AVCY 5 P"
01.08.1992 TIMS/WMS: shows wagon "AVCP 5 C" as having repair "vehicle recommended condemn". 18.07.1993 TIMS/WMS: shows wagon "AVCP 5 C" as having repair "vehicle scrapped". 09.10.1991 TIMS/WMS: shows wagon "AVCY 6 B" as having repair "vehicle reclassify". 09.10.1991 TIMS/WMS: shows wagon "AVCP 6 L" issued at location "Islington Works" with a previous code of wagon "AVCY 6 B"
21.07.1993 TIMS/WMS: shows wagon "AVCP 6 L" as having repair "vehicle scrapped". 10.1977 Fitted with gas heating. 09.10.1991 TIMS/WMS: shows wagon "AVCY 7 K" as having repair "vehicle reclassify". 09.10.1991 TIMS/WMS: shows wagon "AVCP 7 U" issued at location "Islington Works" with a previous code of wagon "AVCY 7 K"
01.08.1992 TIMS/WMS: shows wagon "AVCP 7 U" as having repair "vehicle recommended condemn". 18.07.1993 TIMS/WMS: shows wagon "AVCP 7 U" as having repair "vehicle scrapped". 09.10.1991 TIMS/WMS: shows wagon "AVCY 8 T" as having repair "vehicle reclassify". 09.10.1991 TIMS/WMS: shows wagon "AVCP 8 G" issued at location "Islington Works" with a previous code of wagon "AVCY 8 T"
01.08.1992 TIMS/WMS: shows wagon "AVCP 8 G" as having repair "vehicle recommended condemn". 21.07.1993 TIMS/WMS: shows wagon "AVCP 8 G" as having repair "vehicle scrapped". Note: AN road number "390" was reserved for "CD 9", which was to be recoded "AVCY 390" when transferred to standard gauge but was written off 7.1993 without being recoded. 09.10.1991 TIMS/WMS: shows wagon "AVCY 9 F" as having repair "vehicle reclassify". 09.10.1991 TIMS/WMS: shows wagon "AVCP 9 P" issued at location "Islington Works" with a previous code of wagon "AVCY 9 F"
01.08.1992 TIMS/WMS: shows wagon "AVCP 9 P" as having repair "vehicle recommended condemn". 21.07.1993 TIMS/WMS: shows wagon "AVCP 9 P" as having repair "vehicle scrapped". 9.1965 Entered service as "CD 10". 17.6.1985 Recoded "AVCY 391" as part of the ROA brake van reclassification. 09.10.1991 TIMS/WMS: shows wagon "AVCY 391 D" as having repair "vehicle reclassify". 09.10.1991 TIMS/WMS: shows wagon "AVCP 391 N" issued at location "Islington Works" with a previous code of wagon "AVCY 391 D"
01.08.1992 TIMS/WMS: shows wagon "AVCP 391 N" as having repair "vehicle recommended condemn". 18.07.1993 TIMS/WMS: shows wagon "AVCP 391 N" as having repair "vehicle scrapped". 10.1965 Entered service as "CD 11". 2.10.1982 Transferred to standard gauge and recoded "AVCY" as part of the ROA brake van reclassification. 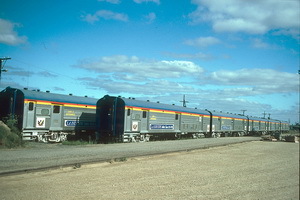 1991 Converted to "OWR" for RICE (Remote and Isloated Childrens Exercise) and TRAINS (Trans Australian Community Services) use. 5.1967 Construction completed and stored at Islington on broad gauge bogies as "CD 12". 12.1.1970 Entered service as "SCD 1" on standard gauge. 15.04.1981 TIMS/WMS: wagon "SCD 1" alteration complete: "FITTING MARKER LIGHTS. (04s81)". 2.3.1983 Recoded "AVCY 378 E" as part of the ROA brake van reclassification. 09.10.1991 TIMS/WMS: shows wagon "AVCY 378 E" as having repair "vehicle reclassify". 09.10.1991 TIMS/WMS: shows wagon "AVCP 378 Y" issued at location "Islington Works" with a previous code of wagon "AVCY 378 E"
01.08.1992 TIMS/WMS: shows wagon "AVCP 378 Y" as having repair "vehicle recommended condemn". 24.6.1993 At Islington painted blue and gold. 21.12.1993 TIMS/WMS: shows wagon "AVCP 378 Y" as having repair "vehicle scrapped". Note: AN road number "388" was reserved for "SCD 2", which in 1988 was on broad gauge, for use as "V and ANR" Joint Stock relief. It was to be recoded "AVCY 388" when transferred to standard gauge but was written off 7.1993 without being recoded. 5.1967 Construction completed and stored at Islington on broad gauge bogies as "CD 13". 1.1970 Entered service as "SCD 2" on standard gauge. 8.1972 Converted to broad gauge. 01.08.1992 TIMS/WMS: shows wagon "SCD 2 J" as having repair "vehicle recommended condemn". 01.08.1993 TIMS/WMS: shows wagon "SCD 2 J" as having repair "vehicle scrapped". 5.1967 Construction completed and stored at Islington on broad gauge bogies as "CD 14". 1.1970 Entered service as "SCD 3". 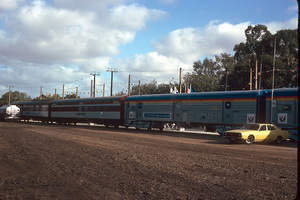 16.1.1970 Used on the first standard gauge passenger train Broken Hill to Peterborough. 20.1.1981 Transferred to standard gauge from broad gauge. 30.1.1981 Recoded "AVCY 379 N" as part of the ROA brake van reclassification. 15.04.1981 TIMS/WMS: wagon "SCD 3" alteration complete: "FITTING MARKER LIGHTS. (04s81)". 13.06.1990 TIMS/WMS: shows wagon "AVCY 379 N" as having repair "vehicle reclassify". 13.06.1990 TIMS/WMS: shows wagon "AVCY 379 N" as having repair "vehicle stencils". 13.06.1990 TIMS/WMS: shows wagon "AVCP 379 A" issued at location "Port Pirie" with a previous code of wagon "AVCY 379 N"
21.11.1992 TIMS/WMS: shows wagon "AVCP 379 A" as having repair "vehicle recommended condemn". 09.08.1993 TIMS/WMS: shows wagon "AVCP 379 A" as having repair "vehicle scrapped".